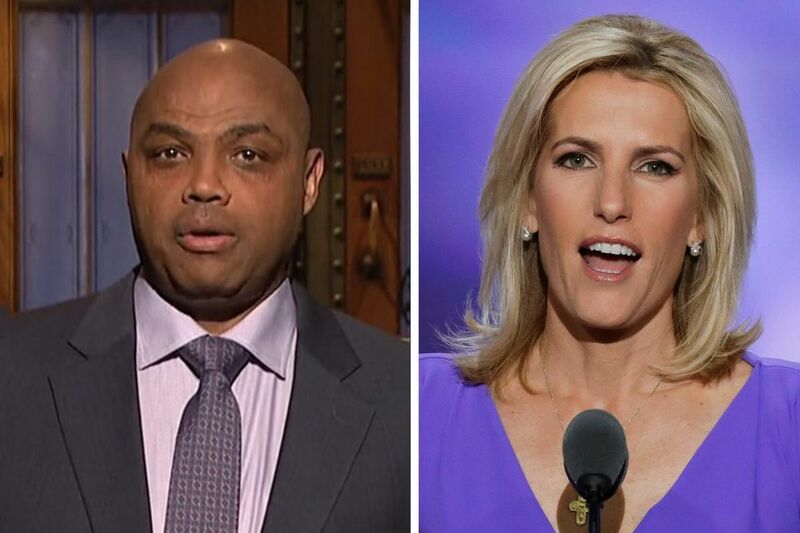 NBA Hall of Famer and Turner Sports NBA analyst Charles Barkley devoted most of his “Saturday Night Live” monologue responding to Fox News host Laura Ingraham. Charles Barkley had a message for Laura Ingraham and Fox News on Saturday Night Live last night: Back off. The former Sixers great and current Turner Sports NBA analyst, hosting SNL for the fourth time, opened the show with a timely monologue celebrating athletes for refusing to stick to sports and speaking out about the current political climate. "I've been saying whatever the hell I want for 30 years, and I'm doing great," Barkley said. "I'm hosting SNL for the fourth time for no reason." Barkley focused his comments on Ingraham, who said NBA superstars LeBron James and Kevin Durant should just "shut up and dribble" after they both criticized President Trump during a recent interview with ESPN's Cari Champion for LeBron's new digital media company, Uninterrupted. "Must they run their mouths like that?" Ingraham said. "This is what happens when you attempt to leave high school a year early to join the NBA. And it's always unwise to seek political advice from someone who gets paid $100 million a year to bounce a ball." Obviously, Ingraham's words didn't sit too well with Barkley, who has remained an outspoken critic of Trump and played a prominent role helping Doug Jones become the first Democrat to win a Senate seat in Alabama in a quarter-century. "We can do a lot more than dribble. I'm a broadcaster. I wrote a book, I've even got my own wine," Barkley noted, offering a not-so-subtle plug for CB Vineyards, which donates all its profits to charity. "LeBron, keep on dribbling, and don't ever shut up," Barkley said. "And maybe one day, you can host SNL for a fourth time just like me." Unfortunately, Barkley was largely wasted on a series of forgettable sketches ranging from an overly competitive dating show contestant to a construction worker wondering what type of clothing he'd wear if he were a woman. Even an appearance by retired baseball star turned Fox Sports and ESPN broadcaster Alex Rodriguez during a skit on sports legends largely fell short. Although Barkley, who played 16 seasons in the NBA, did manage to get in a good shot against the Rockets, where he finished his playing career. "The last four were in Houston. That should just count as one," Barkley said. One of the few sketches that stood out was Barkley's turn as a pitchman for Ned's Roach Away (NRA), where "God-fearing" roaches are given AR-15s in order to kill bad roaches. "At Ned's, we know the only thing that can stop a bad roach is a good roach with a gun," Barkley's exterminator says. "The bang means its working." Another was Barkley's role as Mr. Leonard, an educator who hosts a show called Homework Hotline on public access cable. Unfortunately for Mr. Leonard, all the callers want to do is mock his relationship with his puppet sidekick, Mr. Bobo. Frankly, Barkley deserves an Emmy for remaining in character as Bobo vigorously rubs his pant leg in an attempt to create static electricity. As for the show's final sketch, featuring a desperate Barkley hooking up with Kate McKinnon's booze hound Sheila Sauvage, the less that's said, the better.